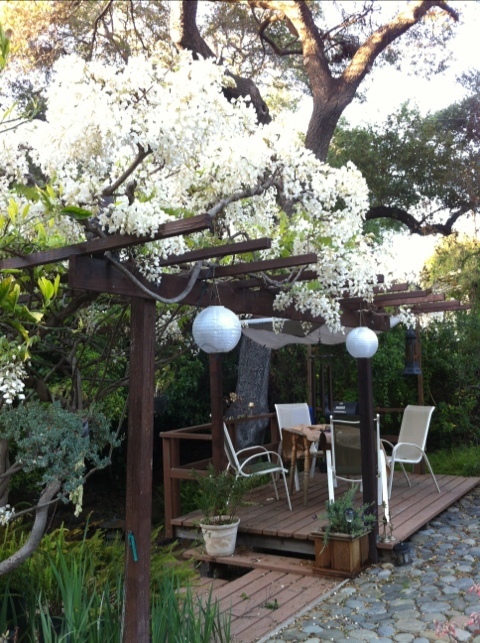 The white wisteria starts to bloom in March and is in full bloom by tax time. I sit out here on some afternoons, with my laptop and tea, and work for the last hour or two of my day. Dappled warm afternoon sun, cool lazy breezes, the wisteria doesn’t have a chance to be smelled because the heavy scent of jasmine is nearby. Only the solid black bumblebees take notice of it’s delicate scent and cling to flowers that sag to one side due to the bees weight. Honeybees visit too. The air around the arbor vibrates with so many bees visiting at once. I have never had a single bee give me any trouble while I work. I wonder what wisteria honey tastes like. at the home of Steve Pisaris.